zCover Inc, pioneer and trend-setter in the fashionable silicone products market, has announced today the release of their iSA Micro Tough Fashionable Silicone Protective Case for the iPod Nano. The iSA Micro Tough case features an unprecedented combination of protection and style. It's enhanced all around protection with a reinforced silicone layer design as crash cushions add beauty to iPod Nano as well as ultimate protection against force impact. Compact and glove fitting the cover looks to enhance atheistic style of the iPod, not cover it. The case's versatility is increased by the numerous options of attachment found in the zCover accessory range. Compatible with all zCover attachments the case has the ability to attach stylishly and practically either by lanyard or clip. "It took us years to develop and perfect the mass production technology of multi-color silicone cases. This iSA Micro Tough case features an unprecedented combination of functionality and style. 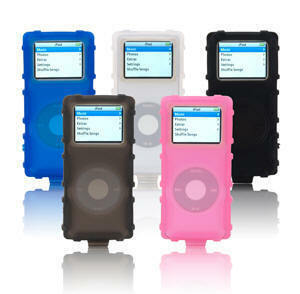 IPod users can now dress their iPod Nano rather then conceal it, showing individualistic style and color. Available in five colors the iSA Micro Tough is set to come in the one that suits you or your mood. It is now possible to have fashion and style while keeping your treasured device safe." said Sean Sa, vice president of zCover Inc.
Each zCover "iSA Micro Tough" retail pack contains one Tough case, one removable lanyard, a removable rotary Belt Clip and one hard crystal clear Screen Protector with soft rubber ring pad for added screen protection. This is the accessory with it all. In this first release of iSA Micro Tough, zCover will feature silicone cases with living five colors. They are exclusively designed to give a splash of extra color and excitement, while providing durable protection. zCover iSA Micro Tough offers you a choice of five fun and bright colors: Tough Blue, Tough Pink, Tough Black, Tough Grey and Tough Ice Clear. Each zCover iSA Micro Tough (retail packaging or on-line-order packaging) for the iPod Nano contains one iSA Micro Tough silicone case, one hard crystal clear screen protector, one removable lanyard and one removable rotary Belt Clip.